Polydeck Screen Corp. adopted this simple adage from its co-founder, Manfred Freissle. The adage not only serves as a motivational tool for the company, but it is a way of life for Freissle. From leaving a broken Germany after World War II to working after hours in a garage developing an innovative product that set a global standard for screen media, Freissle made a lasting impact on the aggregate industry. 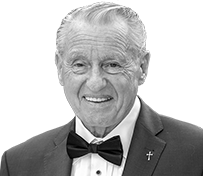 His determination, combined with his entrepreneurial spirit, was the driving force behind the development of synthetic modular screen media – an innovation that changed the screening universe forever. Freissle’s contribution to the aggregate industry is the product of learning by doing. An electrical engineer by trade, Freissle jumped head first into the aggregate industry with no experience, and he emerged as a worldwide leader and expert in screen media. Freissle grew up in Germany during World War II, when he completed his electrical engineering apprenticeship. After experiencing Switzerland for a year of work, Freissle moved to South Africa to work as an electrical engineer on the railroad lines connecting major cities in the country. While Freissle struggled with his English in South Africa, a fellow German, Helmut Rosenbusch, helped him communicate. A friendship developed between the two and led to Freissle’s introduction to the aggregate industry. Rosenbusch worked as a woven wire master weaver for a South African company that manufactures wire cloth screen media for the aggregate industry. Freissle, now introduced to screen media and the aggregate industry, decided to start a wire weaving company with Rosenbusch. With Rosenbusch’s expertise and Freissle’s entrepreneurial spirit, the two created Screenex – a woven wire screen media company – inside a garage. The two worked after hours on a self-built weaving loom, fulfilling woven wire screen media orders for aggregate producers that larger wire cloth companies were reluctant to take. Whereas larger companies preferred to take bulk orders, Screenex fulfilled orders for just one or two screens. Freissle was involved in all aspects of wire screen manufacturing, from the initial order to delivery to installation. His heavy involvement around Screenex led him to question if there was a better way to approach screen media. Ultimately, a call from a customer paved the way to Freissle’s solution. Thus, the synthetic modular screen was born. Manfred developed modular synthetic screen media, and each modular panel had “pins” that were used to hold each tile on the screen frame. The original model Manfred developed had 20 pins, but only four pins per square foot are used today. Selling this innovative product was at first a challenge for Manfred. To convince aggregate producers in South Africa, Manfred gave several of these synthetic screens to producers for testing. It was slow to start, Peter says, but the product eventually built momentum with producers. The development of modular synthetic screen media led to less downtime, less cost of ownership for producers and to more than 40 worldwide patents for Manfred. After receiving a U.S. patent on the screen media, Manfred made the move to Spartanburg, South Carolina, with Polydeck co-founder Dieter Egler. According to Peter, the Chamber of Commerce in Spartanburg offered incentives to establish Polydeck Screen Corp. in the city. The German community, German club and German beer festival were also helpful in the decision to move to Spartanburg. “We wound up here in Spartanburg because of the German beer,” Peter jokes. To Peter, his father’s greatest career accomplishment is the globalization of modular screen media. Outside of his work, Freissle is a family man anchored by charity and his strong faith. Even considering the globalization of his work, Manfred measures his success through his family and charity work. Manfred’s Catholic faith was also important to him. From age 8, Manfred went to church every day and lived near a Sisters of Mercy convent. Because Manfred came into some success in South Africa, he donates to a local Sisters of Mercy convent to show his support. He is still active in philanthropy events today. Manfred, a father of five, devoted his life to his family. His faith and family are major driving forces behind his determination. “He is an awesome dad and his hobby is his family,” Peter says.